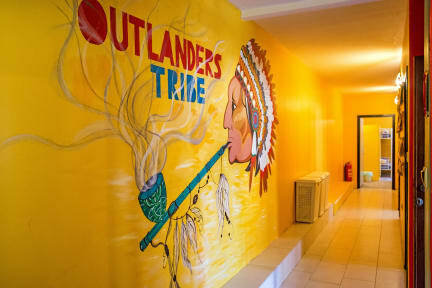 Outlanders Tribe was started in 2014 by Steve and Dora, a traveler and a local, with the mission of creating a chilled-out, community-based hostel where everyone is one big family. We believe in a relaxed atmosphere, personal approach, smiles and good vibes, so if that is what you're looking for, welcome to the Tribe! PLEASE NOTE: If you are a high maintenance traveler with high demands, or desire a five star 'flashpacking' experience, there are plenty of other options in Split. We are a simple community oriented hostel with basic facilities. There a cat on the premises, so if you are not a fan of cats, or have allergies, please book elsewhere. We are located a 10 minute walk from the city center with all the major sights and less than 5 minutes from Split's famous park-forest Marjan. A haven for hikers, runners, cyclists, rock climbers and nature lovers, Marjan boasts spectacular vistas of the city, 14th century stone churches and some of Split's best beaches. The hostel is freshly painted and furbished, featuring a common room with a tv, book exchange and board games, as well as an outside patio perfect for sipping a beer and meeting fellow travelers. All dorms have air conditioning and backpack-size lockers. Facilities include a kitchenette, laundry service and wifi. We are happy to provide you with all the information you need on Split and the region, tips on good local places to eat and drink, day trips, etc. Group dinners, movie nights, drinking games and various activities are organized daily. We welcome backpackers of all ages and nationalities - your Vibe attracts your Tribe! You must provide the CVV code of the used credit card to the property directly after the booking was made. Only then can we guarantee your reservation. If you do not provide the code, we reserve the right to cancel your booking. In that case, payments, such as the deposit, are non-refundable. Cancellation policy: 48h before arrival. In case of a late cancellation or a no show, you will be charged for the first night of your stay. Payment is upon arrival by cash only. There is a patio curfew after 10.30pm due to city noise restrictions. Hostel close to the old town center. The staff is gentle ana ready to help you for all questions about the city, the islands and the night life. Hope to see you again in my next trip in Croatia.